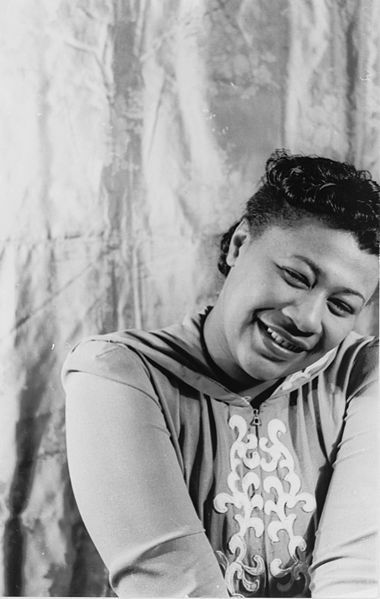 It’s hard to imagine that a giant of popular song, and a singer who re-defined jazz singing was once a showbiz hopeful making her debut on the Apollo Theatre Amateur night (which still happens there in 2014, 80 years later, on Wednesday nights …). But, in November of 1934 at age 17, that’s exactly what happened. The rest, as they say is history. And what a history it was! From poverty and homelessness, to fame, and more importantly to the eyes and ears of people across cultures with an unmistakable voice that could sing anything, from “A-Tisket, A-Tasket” to “Sunshine Of Your Love”. Thanks, Apollo Theatre Amateur Night! Rock ‘n’ roll is not a type of music. It was a social phenomenon that threaded together music of many American cultures by the 1950s, and continues to be that today on a global scale. 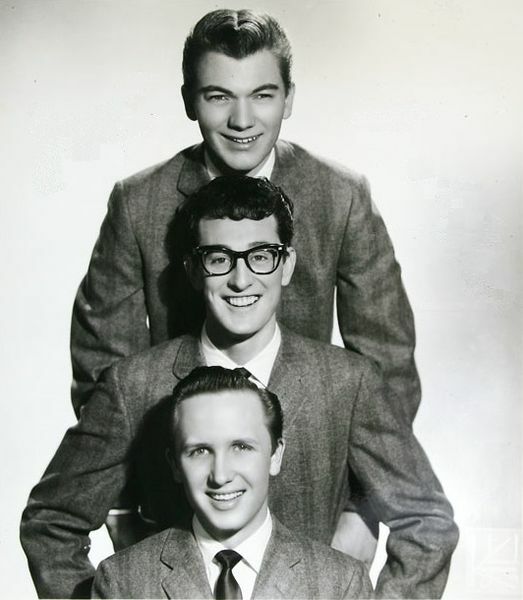 To prove the point of the range of rock ‘n’ roll music of their era, Lubbock Texas band Buddy Holly and The Crickets performed at the Apollo Theatre in August of 1957. Expectations were certainly undercut in the days before the civil rights movement, when audiences and musicians of various races simply did not mix. But, thanks to their historic show at The Apollo, this rule was gloriously broken. Buddy Holly and his bandmates were the first white rock ‘n’ roll group to play the venue, rightly known as a center of African American culture and artistry. Their appearance helped to demonstrate how that artistic reach went far beyond the confines of that particular culture, and that rock ‘n’ roll was indeed here to stay, in part because of its defiance about how those of different races and cultures were once expected to connect (or not) to each other. Since then and among many other rock acts, John Lennon, Blondie, The Arctic Monkeys, and Metallica have played the Apollo, very aware of how rock music owes a debt to the venerable venue and the musical traditions it represents, welcoming acts of all cultural backgrounds even if it remains to be an African American institution. 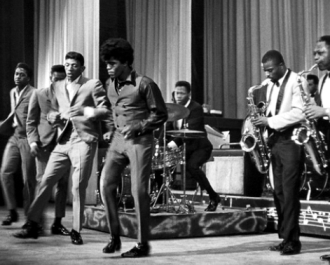 James Brown is now a venerated god of soul music, or at least a godfather. He is also among those responsible for the development of funk from the late ’60s and into the ’70s, which changed the game for R&B. Brown had been an amateur night contestant in 1956 at the tender age of 22. But, in April 1959, he was the opening act for Little Willie John at the Apollo Theatre with his new band The Famous Flames, featuring stalwart co-founder Bobby Byrd. Brown’s profile would only increase in the ensuing years, with the Apollo Theatre playing a central role. The venue would be a frequent one for James Brown. But, possibly the most famous date was in October 1962, when he recorded Live At The Apollo. The record captured his energetic live show, raised the profile of soul music for a broader audience, and made him a star. But, it also captured an era, and helped to immortalize the venue on an international scale. I’m totally cheating here by listing so many acts under one entry on this list, of course. But, c’mon! The sheer weight of history that the Apollo represents is immense. So, let’s talk about Motown, and the revue shows of the early ’60s that included Smokey Robinson & The Miracles, Gladys Knight & The Pips, “Little” Stevie Wonder, Marvin Gaye, The Four Tops, The Supremes, and many other acts that would go out to sell millions and millions of records by the end of the 1960s. Motown founder Berry Gordy had ties to the Apollo, knowing that his key audience – young America – were regular attendees. Package shows featuring artists in his roster made a lot of financial sense. But, he also knew that a ready-made pool of talent was waiting to be discovered by a wide-eyed world longing for transcendent pop music. Paying his dues as a side musician for other Apollo stalwart acts Sam Cooke, and The Isley Brothers, Hendrix proved himself to be an exceptional guitarist even as early as 1964. That year, he too was an amateur night winner, and became $25 richer for his efforts. Hendrix would continue as a sideman to Little Richard and Wilson Pickett (the latter pictured above), by the next year, as well as being a solo artist playing other clubs around town, including Cafe Wha? where he was discovered by Chas Chandler in 1966. From there, he’d be spirited away to London where he’d become a revelation to every rock guitarist on earth. But, his appearances at the Apollo would provide an important boost to a career that has since passed into the realm of the mythic. When she was signed to Columbia Records in the early ’60s, she’d already established herself as a precocious talent as a singer of gospel, R&B, and jazz. And her greatest successes lay before her. Even at the height of her powers, her dates at the Apollo would be legendary. One such set of appearances would be in 1971, when she played a series of sold out dates there. The marquee on those shows would read, simply: “She’s Home”. This would be in the latter days of the theatre’s first era. It would close in 1976. But, it would not be the end of the Apollo. Not by a long shot. It would re-open two years later with a whole new era in front of it. Hailing from Gary, Indiana, The Jackson 5 made a musical pilgrimage to the Apollo Theatre for the first time in 1967, winning the amateur night competition with an nine-year old Michael Jackson in the line-up. And on that occasion, a very impressed Gladys Knight (whose birthday it is today as I write this – she’s 70!) sent a tape of the group along to Motown. It would take a few years, but eventually they’d become one of the biggest acts on the Motown roster in the 1970s, and setting the template for boybands that endures to this day. Michael Jackson would transcend the heights of stardom as a solo artist, serving as an avatar of pop culture in the 1980s. In 2009, the year Michael Jackson died, a memorial was staged at The Apollo, remembering a giant of an artist forever associated with an equally legendary music venue. Just as Buddy Holly & The Crickets were the first white rock ‘n’ roll band to play the Apollo, being one of the architects of that stream of music, so did Bob Marley & The Wailers serve as the first reggae band at the Apollo on October 28th, 1979. By this time, Marley had taken a break from touring, and it was the Apollo date that saw him return to the stage. Having started as a musician who loved American soul music, which resulted in a Jamaican take on that tradition which later morphed into reggae, the Apollo served as the conduit to presenting the music to American listeners in that very same institution were soul music had grown up to inspire Marley and other reggae artists. Apart from being a revelatory appearance, Bob Marley & The Wailers showed that the music that the Apollo had helped to make internationally accessible could produce important international returns, and cultural exchanges with common roots in African culture and folk traditions. It showed that the music made there had made a positive impact, and that a single venue could make all the difference for musicians and for listeners no matter which culture that produced them. Prince played the Apollo in March of 1993, by this time setting aside the “Prince” name, and choosing a symbol instead. But, that’s not all Prince understood about symbolism, and the power of an important location for an exclusive televised concert for VH1. The Apollo proved to be ideal, particularly because by the 1980s, it had been set up as both a recording studio and a TV studio. Showtime At The Apollo had become a popular TV show for six years by the time Prince took to the stage as a a part of his Act 1 tour in March of 1993. The concert was broadcast on both VH1 and MTV. This certainly expanded Prince’s reach to those audiences who were looking for the soul, rock, and funk that Prince had pioneered in the 1980s, largely inspired by many of the acts that preceded him in venues like the Apollo. But, it also shed some light on a venue that by this time was legendary as an important cultural center, practically a co-star of the show. And it was for charity as well, connecting to the community in yet another way! Not every star and era-defining artist that started out at the Apollo Theatre was an instant success. Lauryn Hill would go on to form rap and R&B act Fugees, and make a splash with a high-profile solo career too. But, when she appeared on the aforementioned Showtime At The Apollo at the tender age of 13, she was booed! Sometimes, it takes a while for your audience to catch up, or for an artist to rise to their full potential. But, one thing that she showed even this early on is how resilient and full of self-belief she was, an important set of skills to have besides a beautiful singing voice that she would eventually develop and fully possess. If a venue that holds that much history teaches us anything it’s that temerity, tenacity, and endurance can serve anyone, whether 13 or 30, male or female, amateur or veteran, future star or one-shot deal. The Apollo has opened its stage to all of these. 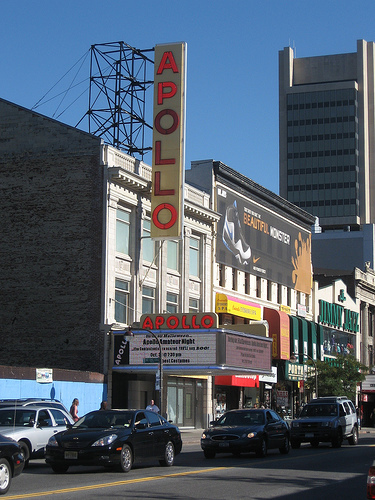 The Apollo Theatre in Harlem in New York City is a musical institution, and a major American cultural centre. It has served as a means of promoting and developing American talent from the 1930s to the present day. Many of the legendary acts that continue to amaze us, or have left us a vital body of work after they’ve passed on owes the Apollo a debt of thanks, even as music fans owe those artists the same. To list the full roll call of this long line of artists would make for a very long piece, as I mentioned, Hopefully this list of 10 will capture the spirit of the history of the Apollo, and maybe get you thinking about some of your favourite acts that you can remind me about in the comments section of this post. In the meantime, you should know that on June 10, 2014, the big 80th Anniversary of the Apollo Theatre is on at 7PM. This includes a live event, hosted by singer and TV host Wayne Brady which will also include performances by Smokey Robinson, Gladys Knight, The Isley Brothers, and Natalie Cole. To learn more about the event, you should visit apollotheater.org. This post is dedicated to the memory and the legacy of poet, author, actor, screen writer, and global civil rights activist Maya Angelou, who also appeared at the Apollo Theatre – as a singer! She died today (May 28, 2014) at the age of 86. Rest in peace. You were among the best of us. Great article, Rob. Thoroughly researched and broad in scope. The ‘venues’ topic is a nice one. In the 90s my radio partner in crime and I did a series of shows on famous venues… The Fillmore, The Rainbow, The Sydney Opera House! PS. Love that photo of young Jimi with Wilson Pickett. I didn’t realise so many cool bands had played at the Apollo! Great article! Yes – so, so many. It really reflects a remarkable cultural heritage. So many of the legendary venues here in England have been closed due to complaints from residents which is such a shame. Some venue have made come backs like The Cavern Club in Liverpool which is miles away from the original! Buddy Holly and the Crickets was the biggest event in Apollo History. A hugely arguable point. But, yes – certainly one notable event in a history of notable events. The list was not on point The shows that really define the Apollo were James Brown The Unifics Linda Jones Funkadelic 2 weeks Kool and The Gang Jackie Wilson. The Moments. Billy Stewart The Nite-Litters and The Delfonics my reason for my choices regarding the Apollo is because I was there for those shows and had been going to shows there for over 45 years or more I also live in the neighborhood. This list is wrong concerning Buddy Holly. Buddy WAS NOT the FIRST white rocker to play the Apollo. That honor belongs to Jimmy Cavallo and the Houserockers. Jimmy beat Buddy by several weeks. Well, Gary – that’s certainly what this Wikipedia page says.